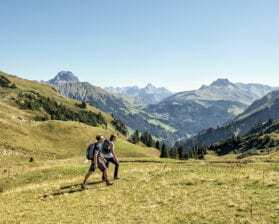 What is going on in the Bregenzerwald? 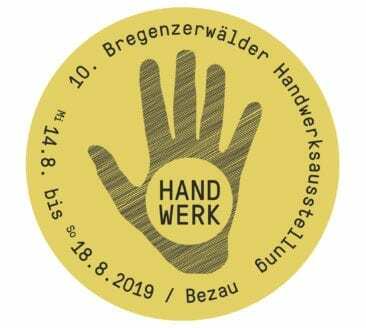 The Bregenzerwald Handwerksausstellung will be celebrating its 10th anniversary in August 2019. Bregenzerwald with its 22 beautiful villages is located in Vorarlberg, Austria’s westernmost state, just kilometres from Lake Constance. About 30,000 people (and nearly as many cows) make their home in Bregenzerwald. The people here could be described as confident, independent, proud of their heritage and yet open to new things. The successful, bold mix of tradition and modernity is evident in the region’s famed architecture and craftsmanship. 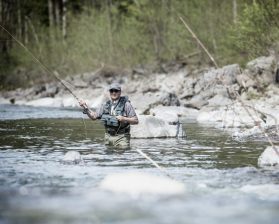 Both disciplines are closely interlinked and symbolise that which the residents of Bregenzerwald understand especially well: Namely, aesthetics, beauty, enjoyment and, at the same time, the carefully considered. Many hotels, B&Bs and holiday farms cleverly combine old and new. Some were constructed just in the last few years and boast a sense of subtle style. Wood, which grows in abundance in the Bregenzerwald’s forests, plays a key role. 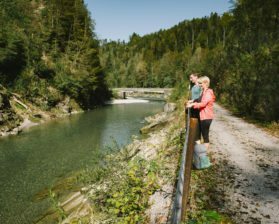 The 12 special ‘Umgang Bregenzerwald’ trails, which guide visitors through select towns, provide insights into the region’s enthusiasm for creation. Along each trail, discreet rust-coloured poles draw attention to noteworthy buildings. The cultivated landscape is also a highlight and farmers are primarily responsible for caring for and retaining this distinctive environment. Typical agricultural practices in Bregenzerwald rely on principles of Alpine Transhumance (three stages: valley – mid elevation pasture – high mountain pasture). Cooks at the many inns and restaurants are adept at refining regional specialities and products used primarily originate from local farmers or producers. Interestingly, most farms are small and average 12 cows, mostly for milk. From such milk, Bregenzerwald’s most famous speciality is produced: cheese – including Alpine cheeses, mountain cheeses and other varieties. 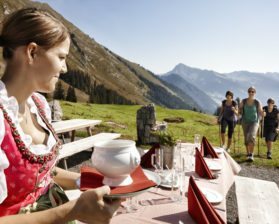 Various gourmet stations and events along the ‘KäseStrasse Bregenzerwald’ provide insights into the area’s cheese culture. 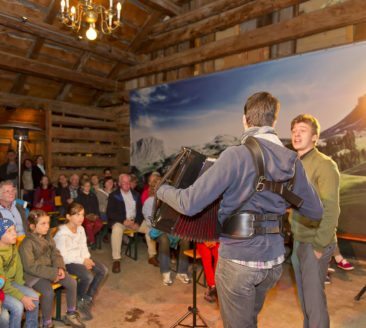 For a primarily rural region, the Bregenzerwald features a decidedly rich cultural programme. 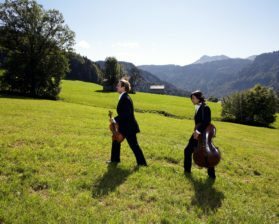 The largest festival is the Schubertiade Schwarzenberg. 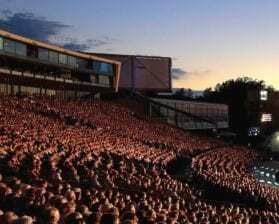 Many guests on holiday in Bregenzerwald make time to visit the Bregenz Festival, which is known for its spectacular operas staged at the lakeside. The modern Werkraumhaus in Andelsbuch acts as a showroom for craftsmanship and creation in Bregenzerwald. Swiss Architect Peter Zumthor planned the building. The Women’s Museum (Frauenmuseum) in Hittisau and the Angelika Kauffmann Museum in Schwarzenberg both feature changing exhibitions. 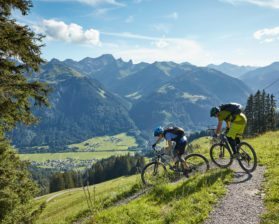 Bregenzerwald’s beautiful landscapes, featuring gently rolling hills, wide open spaces, romantic river valleys and impressive peaks, are a true joy for the senses. Hikers, cyclists and mountain bikers make the area their playground in summertime. There is also plenty of space for fishing, golfing and climbing. 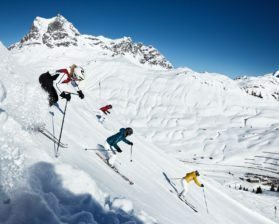 Meanwhile in wintertime, skiers and freeriders glide over the slopes and ridges at large ski areas such as those in Damüls-Mellau and Au-Schoppernau. 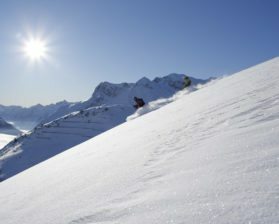 The Warth-Schröcken area is connected to the Ski Arlberg region. 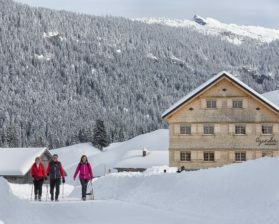 At the same time, ski tourers, cross-country skiers and winter hikers enjoy the quiet side of winter. 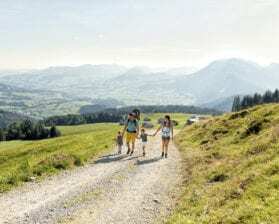 Those interested in combining a holiday in Bregenzerwald with wellness or for those seeking fresh ideas for healthy living, we recommend staying at one of the many health or wellness hotels. Some offer fasting courses, baths, active programmes, packing treatments featuring fresh ingredients from the moor, and so much more! The majority of wellness areas were constructed in the last few years and feature windows into nature and typical Vorarlberg timber architecture. 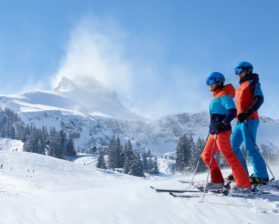 Additionally, many natural cosmetics are produced in Bregenzerwald. For instance, the Metzler family makes products from whey, Susanne Kaufmann prepares fine essences from Alpine herbs, and the Bentele brothers fashion cosmetics from honey.